There were two French women next to me in the screening of Michael Winterbottom's new film, EVERYDAY. They talked throughout the film and would sometimes laugh at strangely inappropriate moments. Normally, I would've asked them to be quiet, but as it turns out, eavesdropping on their banalities was about as much entertainment as I got in the 90 minutes runtime of the film. Which is not to say that the film isn't well-made. It's just that nothing actually happens. Shot over five years, the film is about a family living through the imprisonment of the father (John Simm). 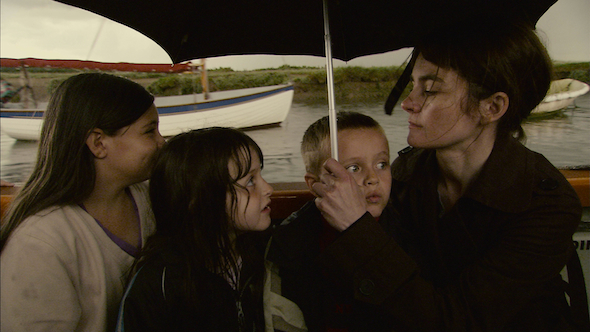 This involves the mother (Shirley Henderson) gathering up her four kids in rural Norfolk, and taking trains and buses to get to a variety of prisons in which the father is held. We see that both parents love their kids and each other. Casting the kids from the same family also helps bring an air of intimacy and authenticity. And by shooting over the prolonged period, we get a real sense of changing seasons and passing years. I liked the family and I sympathised with them. The problem is that basically nothing happens. The dad comes out on day release, then parole, then for good. The family are happy to see him come home. The End. There's no grim explanation of what he did, or of his chances of re-offending. No social context at all. And because the family is, by and large, loving and warm, no drama to speak of. The result is that EVERYDAY may not be the worst film I've ever watched, but it's certainly one of the dullest. Shame on writers, Michael Winterbottom and Laurence Coriot (HUNKY DORY) for wasting such a good cast and a terrific score from Michael Nyman. EVERYDAY played Telluride, Toronto and London 2012 and will be broadcast on Channel 4 in the UK.